Meanwhile, Assistant District Attorney Joshua Hardaway (Derek Luke) is on the fast track to career success. But Hardaway lands a case too personal to handle - defending young prostitute and former drug addict Candace Washington (Keisha Knight Pulliam)and asks his fiancé and fellow ADA Linda Holmes (Ion Overman) to fill in on his behalf. 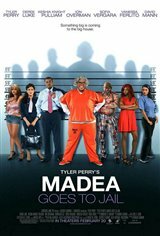 When Candace ends up in jail, Madea befriends the young woman, protecting her in a "motherly" way as only Madea can.